MGM Grand truly lives up to its name, not only in sheer size, but also in its vast offerings. Located at one of the busiest intersections in Las Vegas, it provides a world of entertainment, dining and unwinding — both day and night. 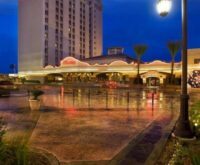 Recently, the resort completed a $160 million remodel to upgrade all of its rooms and suites, has added a brand new nightclub and several new restaurants. Entertainment is plentiful with several options in a variety of unique venues. The Cirque du Soleil show “KÀ” takes audiences on a heroic journey that will feel like the latest blockbuster movie. A lineup of renowned performers come to the David Copperfield Theatre, while some of rock ‘n’ roll’s greatest acts, from the Rolling Stones to U2, take the stage in the Grand Garden Arena — also home to many highly touted championship boxing events. And Brad Garrett’s Comedy Club offers plenty of laughs. You have multiple dining choices at the MGM Grand that include the exquisite tastes of Joël Robuchon and L’Atelier de Joël Robuchon, the sophisticated tastes of Fiamma Trattoria or the classic pub fare of Michael Mina Pub 1842. Whether it’s steak and lobster at Tom Colicchio’s Craftsteak or the beloved American delights at Avenue Café, you’ll never go hungry here. Plus, you can experience the traditions of different cities in Las Vegas — Hakkasan Las Vegas restaurant offers unique Cantonese-style cuisine with flavors of Hong Kong and Shanghai, try Emeril’s New Orleans Fish House for the tastes of the “Big Easy” or venture over to Wolfgang Puck Bar & Grill for the tastes of Southern California. The Morton Group, led by restaurateurs Michael and Jenna Morton, opened Crush — a celebration of food, drinks and friends — at the resort, and Hecho en Vegas, serves a wonderful mix of traditional Sonoran cuisine and popular Mexican favorites. Along with fine dining, there are plenty of places for casual eats — from the MGM Grand Buffet to the ample MGM Grand Food Court and Blizz Frozen Yogurt. The Lobby Bar offers an extensive cocktail list and Centrifuge lures the crowds at nighttime and well into the early morning hours. Tap Sports Bar serves American favorites for lunch and dinner, but guests can also enjoy 48 draft beers, sports memorabilia and watching games on 60-inch HD TVs. A multiple-story nightclub venue — Hakkasan Las Vegas — is open for pleasure seekers who want to delight in dancing, drinking and dining. Keep the party going all day long in the summer at the pool club Wet Republic or relax at the Grand Spa, which offers several therapies in more than 20 zen-inspired treatment rooms, far away from the chaos of the casino. MGM Grand’s enormous casino entices players, with games including blackjack, craps, roulette and an array of slot and poker machines, as well as keno, a baccarat lounge and high-limit slots. The race and sports book offers private skyboxes, a bar and the adjacent Stage Deli. The high-end gaming lounge Whiskey Down has a 64-seat bar that serves up an array of brown spirits and specialty cocktails. Fun and adventure await guests as well. Aspiring detectives (or those who just like to solve mysteries) can get their hands on the interactive CSI: The Experience. Other attractions on site include a television research studio (CBS Television City) and a pool complex with a 1,000-foot-long lazy river and five outdoor swimming pools. There aren’t many hotels with offerings so grand that it’s practically an entire vacation under one roof. With such a wide variety of things to do and see at the MGM Grand, don’t be the least bit surprised if it takes more than one visit to experience it all. A friendly note: All of the hotel rooms are non-smoking. If you smoke, there will be a $350 cleaning fee at checkout. Stay in designated smoking areas and you’ll be fine. great place to stay very clean and well set up lots of stuff to do, easy to get in and out of to visit other places . I only ate in a few places there and they were great serve and great food. people were so nice to talk too. I would stay again and be very happy with the room I got because the room I had was very nice.